Club Penguin Cheats by Mimo777 Club Penguin Cheats by Mimo777: Director Says No More Field Ops! The Elite Penguin Force Director has sent us Club Penguin message! I was right! 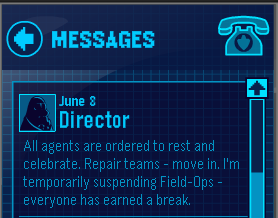 There are no more Field Ops... for now at least! Do you think they will ever return? Well, they are going to return! Director said he will suspend for a while - that can mean one month or one year. Hello Mimo! There are definatly going to be more field ops. Director just said 'suspend.' which means that they will come back, but later. Well, personally I think no more weekly field OPS, but maybe once in a while for emergency missions they'll have one. I hope they have more missions that are more challenging, or at leasat longer. When i went in my igyy my puffle cannonball was not there! so i think they will return at some point.. I didn't like the field ops, they got boring and to easy... I hope the next feild ops will be harder and more awesome. lets hope that mission are coming back! Yes they will return because the Director said that they are temporaily suspended so that means they will return but I don't know when they will return. Yes, I think they will return in 3 weeks. We got 3 medals for doing the Herbert Challenge, so really, we won't loose any medals while we wait for Field Ops to return. And, for some reason, I got the stamp for 50 field ops, even though some people haven't! hes shutting them down because hes bad!! and they will return! Yeh. I got bored of them and only earnt like.. 15 xD I hope they are much better this time. Did he just ORDER us to rest and celebrate?